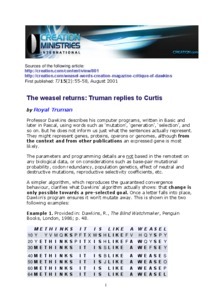 Original title in German: "Die Rückkehr des Wiesels: Truman antwortet Curtis"
Professor Dawkins describes his computer programs, written in Basic and later in Pascal, using words such as ‘mutation’, ‘generation’, ‘selection’, and so on. But he does not inform us just what the sentences actually represent. They might represent genes, proteins, operons or genomes, although from the context and from other publications an expressed gene is most likely.